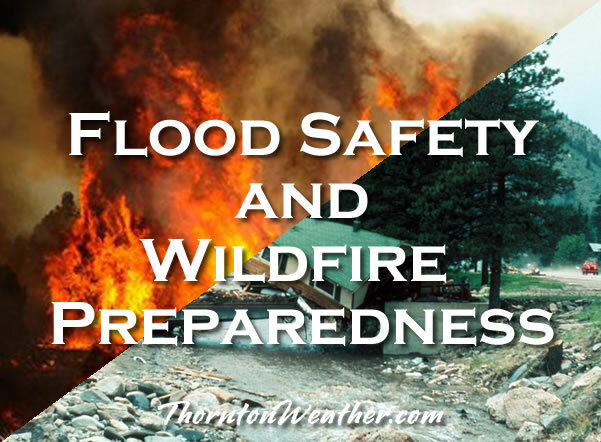 Colorado Flood Safety and Wildfire Preparedness Week, March 3 – 9, 2019. ThorntonWeather.com will be posting each of these messages as a service to our readers. The first of these messages is below. Check back each day this week for further topics. The National Weather Service wants everyone in the United States to be part of a Weather-Ready Nation. Colorado has more than its fair share of floods, flash floods, and wildfires. You should be weather alert and weather-ready, knowing how to stay safe when floods and wildfires affect your area. Now is the time to learn about flood and wildfire risks in Colorado, and to develop your plans to improve your outcome. Flood-prone areas have been identified in over 250 cities and towns and in all 64 counties in Colorado. Over 250 thousand people live in floodplains in Colorado. There are estimated to be 65 thousand homes and 15 thousand commercial, industrial, and business structures in identified floodplains. There are likely many more structures located within unmapped flood hazard areas. The value of the property, structures, and contents located in the identified floodplains is estimated to be around 15 billion dollars. On average, 2500 wildfires occur across Colorado each year. Since 2012, 8 people have been killed when wildfires occurred in the wildland-urban interface. This entry was posted on Sunday, March 3rd, 2019 at 12:01am MDT and is filed under Weather Education. You can follow any responses to this entry through the RSS 2.0 feed. You can skip to the end and leave a response. Pinging is currently not allowed.